Starting a warm spring day with a mid-morning snooze. Hum..is that mom? Sweet ! That means I get cookies and mash. In the barn we go, while mom tacks me up, I get to munch on some hay. I’m excited as today is Monday. Monday is run day. Monday is trail day. What’s this? I’m going out with friends? That’s cool ! We are going to walk through the woods. Wait a minute..aren’t I always the first in line? Why am I in the back? I hate being in the back. Ok..fine…I’ll deal. What’s this about me being in the back. Now that’s not right. Ok, maybe it’s not so bad being in the back. Finally ! I’m in front. I love to lead! An unexpected little storm came up, so back to the barn we went. That’s fine with me as I know my mash is waiting for me. In my next life, I want to be your horse. What a fun filed day. Beautiful shots. I’m not too sure..we do some crazy stuff sometimes. Being a horse is hard work. They sacrifice so much for mankind. We did have fun today. I have always been dreaming about beeing a horse, or a ballett dancer. Nice, Emily. Now those are two totally bizarre things to want to be Bente. If I was reincarnated, I want to be a house cat. I know nothing about horses, have never been in a position to own one, the last time I rode one too long ago to say I was horribly sore in the posterior for way too long, and yet if I get another life I would like it to include a companion horse. Great take on the challenge. LOL ! That is a really funny story Lynne. Have to admit when taking lessons that first year, there was many a day I didn’t want to sit down. 🙂 Having a horse as a partner for many years is such a beautiful experience. Thanks for your kind comment. I’m a dog person this go round and having a non-human companion is rewarding in its own peculiar way, isn’t it? Beautiful Quote ! No wonder I feel like I’m escaping each time I ride. I used to know the recipe for mash, but it’s been so long that I’ve forgotten. I would love a horse. LOL ! That is awesome Jerry. Horses are awesome. I am such a typical American girl. All I thought about when I was a child was having a horse. Finally got one in my later years. Basic mash is eash – bran mash and water. Remy’s is special. 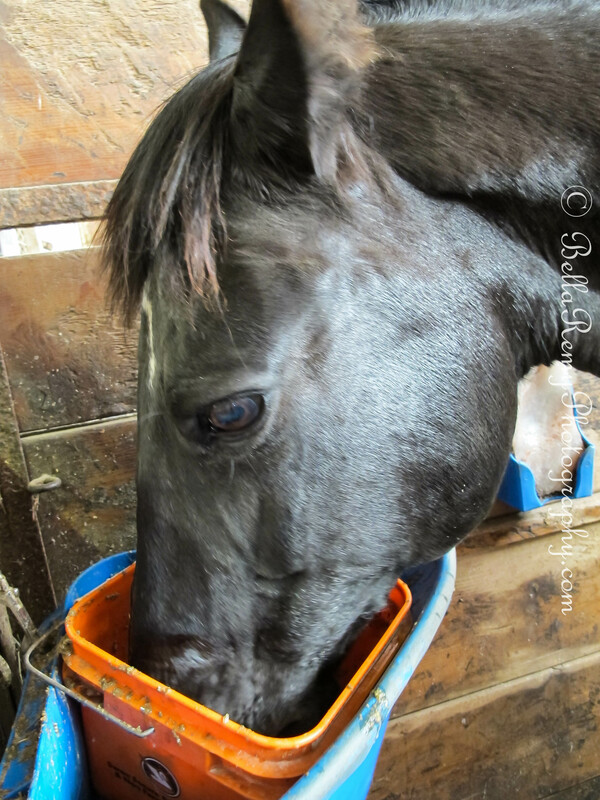 She has all sorts of goodies in it like dried apples, peppermints, oats. NO wonder she loves it so. Such fun; I understand most of the functional connection between horses and humans. It would be interesting to explore how that feeling seems to run so much deeper than that. If you have an open heart and an open mind, you will hear. Many don’t. It takes a lot of intuition and love to have the true deep partnership. Remy and I have a great connection. Now to work on the beast. Three years in and I probably need two more to get him where I would like our partnership to be. Makes me want to go back on a horse and go riding again (although the last time I was near one it bit me)…a few years ago I was hoping to hire a pony and go trekking in Ireland for a week or two looking for caves – unfortunately it didn’t work out and I didn’t make it – but it would be nice to be back on a pony again…great pics. Now that would be an awesome equitrekking trip. Ok..so I’ll fly over to Ireland and get you on a horse and you show me the country side. Deal? Maybe one day…although I have never been to Southern Ireland…and it was a long time ago…but thanks for the offer! It was wonderful until the odd storm brewed in. Remy was a bit concerned about it and wanted to run back to the barn. You’re welcome to come and spend time with Remy anytime Madhu. Wow, that looks lovely. I wish there was somewhere like that round here to ride in. Lucky you! I looked high and low for this barn. It has everything in one place. I think any day with a horse is a great day regardless of where you are or what you are doing. Remy is well-loved and a very happy fellow, it shows. Love being able to experience this world through your photographs! What FUN! And what a gorgeous trail… I’d love to see me with a camera on our girls’ backs. Either one, lol. “Oh nice camera!” Tree. OH YOU MADE ME LAUGH SO MUCH ! I could totally see us doing that. I really wish we lived in the same area. We would have so much fun! Heeeeee! Oh one day, I’m sure… I won’t be here forever. 🙂 We would have a BLASSSSSST! I still have visions of taking our crazy girls out there with my poor Canon. I’m cracking myself up. We just have two cats here. Now this is the girl..the beast is the boy. I have two cats at home. They have me trained well.